Of course the World Series of Poker 2010 is now underway. As I'm not able to be there I've been living vicariously through Alex Carr's tournament reports. After sharing a SNG table with Chris Moneymaker the day before, he looks poised to make his first cash in the $1500 NLH Event #5. 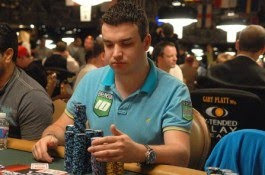 Brits Chris Moorman (pictured below) and Praz Bansi are amongst the current chip-leaders in that event, with 223 players remaining in total. Best of luck to those three going into Day Two! Having started this Supernova challenge as a lowly SilverStar, I found myself needing around 300 VPPs to hit GoldStar for June. With the wedding on Saturday, a visit to the in-laws on a Sunday, and a live WSOP satellite tournament on Monday afternoon (which I will talk about in my next video blog) I'd not left myself much time to get them. As a quick-fix, and with a taste for trying to qualify for the WSOP Main Event, I decided to play a few Steps tournaments to make up the VPPs on Monday 31st May. I didn't quite realise that once you are in the Steps system, you are bound to it (ie. can't take the tournament dollars or whatever), so firing up numerous tables wasn't really a great idea. I really should have read the pop-up when registering for the tournament, I'm just used to TableNinja flicking them off for me! I ended up sinking about $800 into it, but it's going well(ish) so far, as from that I now hold a $700 Step 5 ticket, a $215 Step 4 ticket and 2*$82 Step 3 tickets. At least I got the VPPs, not that they'd have been worth it if I'd donked off the $800! (Sharkscope doesn't seem to track Steps tournaments so will leave the stats out today). 3 Comments to "WSOP 2010 Event #5 (+ SNQ Day 4)"
"Make it to Step 4 and you can use your ticket to enter any PokerStars $215 Weekly Major tournament, including the Sunday Million, Sunday Warm-Up and Sunday Second Chance, or keep climbing toward Step 6." Like the blog and everything you've done with it. This is a blogspot blog? Almost hard to believe, looks so sharp. Any way you can link Gulf Coast Poker up there too? I also "followed" you via facebook's Network blogs.